Biologists say it’s a new disorder that’s popping up across much of the Eastern U.S. and it’s becoming a real problem for some hunters. Todd Buck is your normal, run-of-the-mill deer hunter. He loves nothing more than to spend his fall weekends peacefully perched in a treestand or shooting house on his back-40 in central Kentucky. Buck said times used to be easier and you didn’t have to do much work to prepare for hunting season. Reminiscing, he recounts how they used to trim some shooting lanes and spray for wasps’ nest in shooting houses prior to season starting, and that was about it. That is, until John Bigguns bought 650 acres bordering Buck four years ago. “You can’t hide money! This guy comes in from the city and buys up all my neighbor’s land where I used to be able to legally poach deer and puts up ‘No Trespassing’ signs and signs that say, ‘Property Monitored by Cell Cameras,’ etc,”says Buck. It turns out, the signs were the least of Buck’s worries. Soon, Bigguns was establishing large food plots and planting crops year-round for the deer and wild turkeys. Over the next couple of years, deer and turkey sightings plummeted on Buck’s property. Buck borrowed a hobby tractor and started to disc up ground in open areas and throw rye grass seed before a rain. It sprouted and turned green, but he just wasn’t getting the results Bigguns was getting on his property. The deer and turkey sure weren’t crossing the line to feed either. 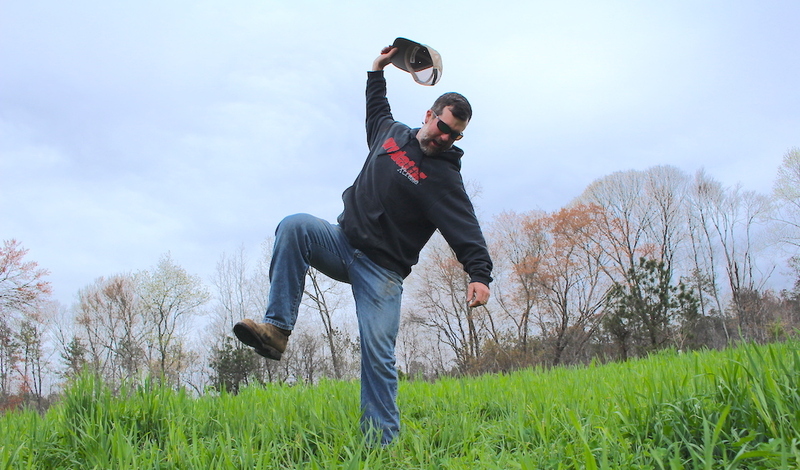 Relationships got even more strained when Bigguns stopped by one afternoon to offer some advice on how to grow better food plots. Many hunter-sabotage incidents have been reported in recent years. In this photo, a disgruntled hunter was captured by a trail camera as he sprayed his neighbor's food plot with Roundup. Unfortunately, hunters such as Buck are left scratching their heads or becoming bitter. Some of these hunters are retaliating, too. Do you have food plot envy? Then subscribe to Whitetail Journal where you’ll learn how to properly amend your soil, spray for weeds and plant quality seeds to attract and hold deer and turkeys year-round on your property. Plus, it’s a free subscription!